A new line of low-cost quick release clamps for use as a clamp, stop, or spacer where ease of use and speed are important is being introduced by Stafford Manufacturing Corp. of Wilmington, MA. The Stafford Quick-Clamp features a cam lever for clamping and a knurled nut for adjusting the clamping preset; making it easy to open-close and clamp by hand without tools. Suitable for use in horizontal and vertical applications as a clamp, stop, or spacer, simply lift the cam lever, slide along a shaft or tube to reposition quickly and retighten in seconds. 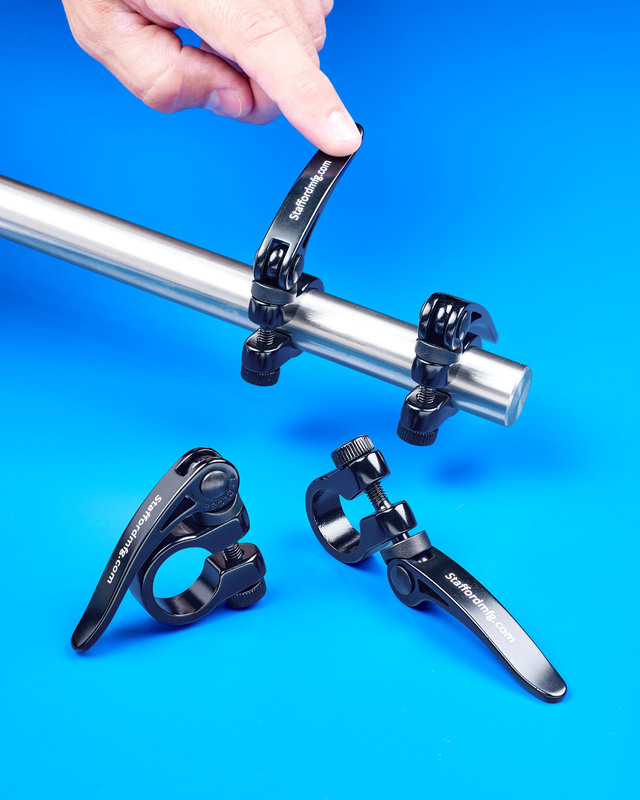 Ideally suited for clamping split tubes and split hubs, fixturing, and tool holding for OEM, MRO, and consumer product applications, the Stafford Quick-Clamp is a lower cost alternative to traditional clamping options. Designed for non-rotary use, these clamps are made from black anodized aluminum with steel fasteners and are available in five sizes from 3/4” to 1-1/2” I.D. Stafford Quick-Clamps are priced from $6.20 ea. (list). Evaluation samples and price quotations are available upon request.